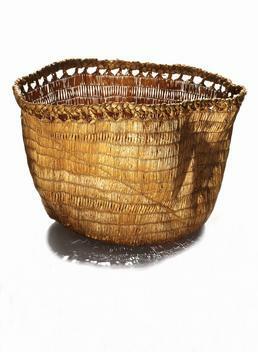 This woven grass basket is for gathering seafood along the beach, or for holding freshly-caught fish. It has a strong carrying cord around the top and an open weave so that water can drain out. Aron Crowell: So what kind of basket is this? Daria Dirks: How they used to gather food. Maria Turnpaugh: It could be for anything—any kind of fish, shellfish or kelp. Mary Bourdukofsky: Gathering seafood along the beach. Aron Crowell: Does that kind of basket have a special name? Daria Dirks: This is biggest [basket] I’ve seen. Maria Turnpaugh: They could be bigger, but I don’t think I’ve seen any bigger ones than this. Mary Bourdukofsky: You know in the Kodiak museum, there was one similar to this. Her name was on it, Alexandra Hope. Daria Dirks: It says Kashega on there [museum catalog card]—Aleutian Islands, Kashega. It’s near Unalaska. Maria Turnpaugh: Look how they weaved. Mary Bourdukofsky: Yes, a big weave. Maria Turnpaugh: They weave those two together and when you come around you weave the next ones. Mary Bourdukofsky: It’s weaved a little tighter and then spreads out. Maria Turnpaugh: They start adding. Daria Dirks: So you think they kept weaving and then just braided it [along top edge]? Mary Bourdukofsky: As they weaved, they must have left little loops. When you braid it, you catch them. 1. Mary Bourdukofsky later called this type of basket a ayg^ag^esix^ [carrying basket] and a chuumyam ayg^ag^esix^ [kelp carrying basket]. The quantity of provisions which they procure by hunting and fishing being far too small for their wants, the greatest part of their food consists of sea-wrack and shell-fish, which they find on the shore. Seaweed and shellfish were especially important in the past when bad weather kept hunters from going to sea in their kayaks. Vasyutinsky’s 1764 report on the Andreyanovsky Island group (Kanaga, Adak, Atka, Amlia, and Seguam) says that “when the weather becomes stormy and continues so for several days, it is not possible to set out to the sea and famine strikes them and their wives and children. In order to prevent starvation they go to the sea-coast, gather sea-weed and different shells, bring them home and eat them raw.”(5) The long stems of kelp were also used to make fishing lines.